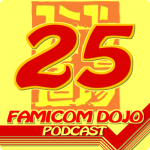 Six months on, how is the Famicom Dojo Podcast doing? Vinnk and Sean take some time out to answer listener mail, reflect on some of their past episodes, and give updates on some of the information that may have gone out of date or had developments since the original episodes were released. Also, Vinnk got a 3DS. Regarding the FC/NES and APIs: there really aren’t any, unless you count hardware registers as an API. �Every game had to handle text display on its own. �Also, in the majority of cases, text was actually displayed using background graphics rather than sprites. �The system can display only a limited number of sprites at once (and even fewer are allowed on a single scanline [hence flickering in manic games]), so background graphics make a lot more sense. Also, since it was briefly mentioned, Famicom Basic has an English font (uppercase only, IIRC…) and a Katakana font. One thing I Noticed, you talked a bit about trying to get the fds working on a regular nintendo, and that the best thing to do is to get a famicom.� I spent some time looking into this, and I came to the same decision.� However, things do�work much better going�the other way.� With not just any famicom, but the AV famicom.� I found/decided that the AV famicom pretty much works with everything (with the exception of the games that use the microphone).��An AV famicom with a simple pin adapter for NES games works with everything I have thrown at it, all the NES peripherals, all the Famicom peripherals, FC games, NES games, disk system.� Many of the famicom peripherals even work with NES games and vice versa with no special tweaking required.� It’s the only NES system I need now. The Hulu being in only the US and Japan is a polical thing, the guys who hold the licenses (MPAA)�are trying to push their new�copyright laws out to other countries, and the US and Japan are already using them, so they allow their licenses to be used by Hulu in those countries.� A bunch of other countries, including Canada are fighting the new copyright laws they want to put in and they want to gain support for them by holding back Hulu and other similar stuff and blaming it on an “unsafe legal environment” or whatever they call it. Re: Community.� I hear you.� I just hope they get and make it through the fourth year, as that seems to be a logical conclusion point. About rerouting Famicom Sound Hardware trough the NES, it’s not that messy. There is this Flashcart for NES (PowerPAK) which simulates some additional sound chips (Konami’s VCR, Nintendo’s FDS) and outputs it on a unused pin to the expansion slot. There, just a little resistor is needed to short the unused pin from the cartridge to the Sound In of the NES itself. Now for Famicom carts, just add a wire to accept the cartridges Audio output to the same unused pin and voil�: Famicom Sound on NES, only two wires. Every Saturday for the last 6 months, I’ve been doing my laundry while listening to this podcast. So, I have two questions. First for Vinnk: Why are there no dryers in Japan? Second for Sean, how do I get stains out and my whites whiter while still keeping my colors brighter?